Today, the NMTC Coalition is excited to release a new report showcasing NMTC success stories from every state and the District of Columbia. These profiles from each state show the flexibility of the NMTC and demonstrate its ability to drive and leverage capital in investment-starved communities, creating economic opportunities and jobs in our country’s poorest rural communities and urban neighborhoods. Every four years, the Coalition releases this report, which serves as an important tool for educating new Administrations and new Members of Congress. 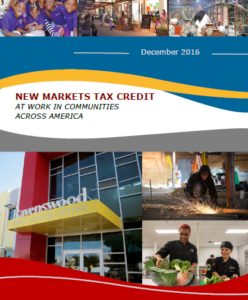 The 2016 edition of the NMTC at Work report features 89 NMTC projects, ranging from rural to urban, from grocery stores, health care centers and community centers to manufacturing businesses and schools, as well as many other important projects identified by community leaders. These profiles from each state show the flexibility of the NMTC and demonstrate its ability to drive and leverage capital in investment-starved communities, creating economic opportunities and jobs in our country’s poorest rural communities and urban neighborhoods. The report includes NMTC success stories and maps of NMTC activity. Super Round Analysis: Where is the Allocation Targeted?